Redlands, California—The National Geospatial Technology Center of Excellence, also known as the GeoTech Center, has selected Esri education manager Joseph Kerski as the recipient of its third annual Lifetime Achievement in Geospatial Two-Year College Education Award. Reserved for individuals with distinguished careers advancing geographic education at two-year colleges, the honor is synonymous with exemplary instruction, innovation in teaching methods, mentoring and support of students, development of educational and workforce partnerships, community outreach, and leadership. 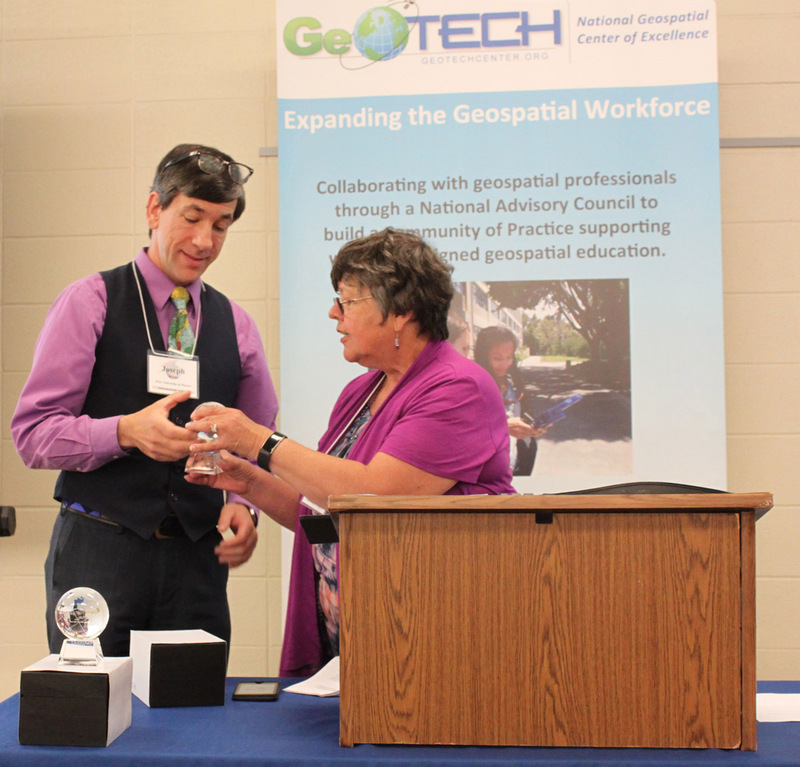 "I believe the efforts of Joseph to improve the skills of learners in geospatial technology have been truly remarkable," said Vincent DiNoto Jr., GeoTech Center director. "He has worked tirelessly to bring spatial learning to all members of the professional and general public in his efforts. I have personally used in my classes concepts that he has developed." Kerski's passion for geography takes him around the world as a college instructor and geospatial education evangelist at Esri. Whether it's advancing the ConnectED initiative—a program that offers free geographic information system (GIS) technology to every K–12 school in the United States—or visiting colleges nationwide to hold lectures, colloquiums, and discussions, Kerski makes it his business to entrench himself in building the education community. "Having worked with dedicated students and instructors at the community college level for many years, and knowing how dedicated they are to lifelong learning, spatial thinking, and geospatial technologies, it is a great honor to receive this award," Kerski said. "The GeoTech Center has long provided leadership in the geospatial technology competency model and supported instructors at the community college level and, in so doing, has further expanded the horizons of GIS." 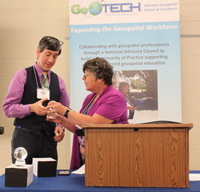 The GeoTech Center presented Kerski with the award during its annual GeoEd Conference, held June 6–8 in Louisville, Kentucky, at Jefferson Community & Technical College. For more information on geospatial learning in education, visit esri.com/education.